Metallic gold eye makeup is a newer trend and mostly relates to glittering golden eye shadows, shimmers, highlighters, eye liners, and bronzers. No doubt, gold eye makeup has been fascinating women for decades, and maybe even longer like from Cleopatra’s days. Gold eye shadows and gold eye liners gives an instant fresh look and is relatively easy to master. 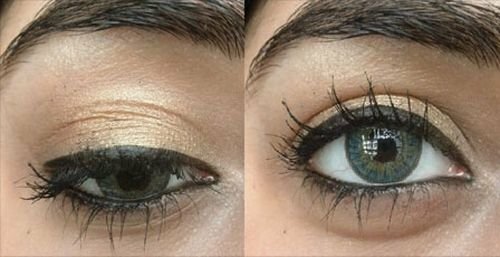 In this post, we’ll discuss seven bold and gold eye makeup ideas that you should consider before giving gold a go. We’ll also share some Gold eye makeup tutorials videos can be found at the end of this page. This look is obviously not for everyone because it is a bit bold and may not suit darker complexion or women with dark patches on their skin. Plus, it will best suit to women with smaller lids and lighter brows. Apply this sheer gold color with a soft and fluffy brush because this kind of brush will pick minimum color pigments and will not overdo your look. A stiff and flat brush will work well when applying opaque colors to create dense and dark look. Because flat brushes are known to deliver more color. 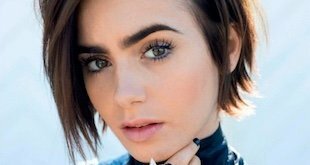 Black eyeliner and mascara will complement this look and don’t forget to fill in your brows with a color close to your skin tone or foundation for a balanced look. Stila offers a full range of metals eye shadows that you can use to create mesmerizing gold smokey eyes. The stila Magnificent Metals range includes striking cream to powder metallic finish eye colors that deliver a rock and roll sparkle to your eyes. The packaging includes a mixing tray and primer. First add a drop from the primer to the tray to create a base. Then add a dab of eye color to it and mix well. Now pick an applicator and gently apply the color on your upper lid, give soft strokes for perfect blending. You can add extra layers if you want to build more intensity. When we talk about applying gold eye makeup for dark skin, we have to be conscious because gold for black goes in high contrast so slight mistake in the selection of shades can worsen the situation. This model’s eyes look like a shiny diamond and she has worn intense gold eye color well blended with black. Gold eye makeup is applied on the lid to enable eyes to pop up and black is used in the corners to accentuate the overall look. For more finishing, apply a very thin line of black liner on the upper lash line. Then attach false lashes and you’re all set to rock the party. This is a perfect night time look with gold eye makeup. This gold eye makeup tutorial focuses on creating a simple wearable look with gold eye shadows. You can use Maybelline Diamond Glow Eye Shadow to achieve this look. Now pick a dense eye shadow brush and apply gold eye shadow on the entire lid below the crease. This model has used Lakme Eyeconic Kajal for the lid and Maybelline Diamond Glow Eye Shadow for outer corner of the upper lid. This pale shade from Maybelline will work as a highlighter too, so you can use it on your brow bone as well. Now apply the kohl pencil and mascara of your choice and finish the look with false lashes. 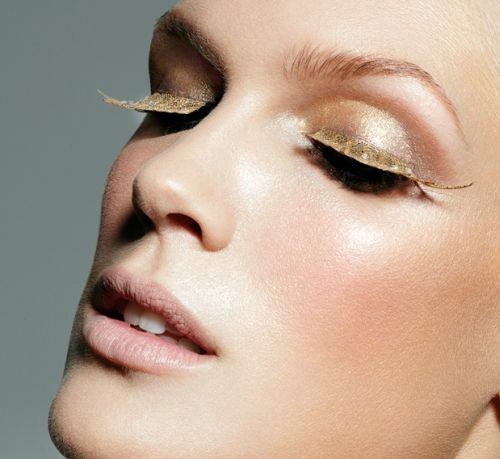 Golden falsies will make you stand out of the rest when you wear them on a prom night. This is surely a show stopper kind of look that will get you a lot of good compliments from your friends. You can go anywhere from wearing a few strands of gold to a total lush gold pair of lashes that is so exaggerated that it doesn’t look like lashes anymore. 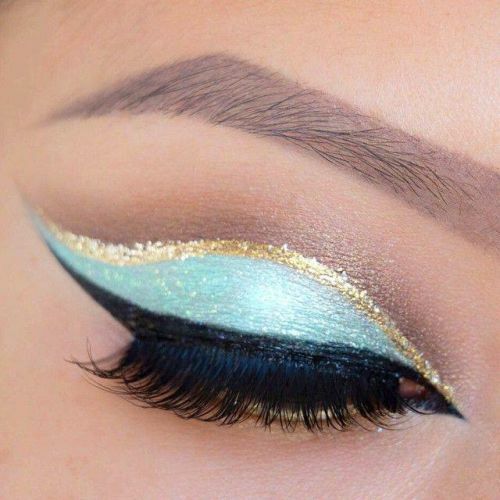 For a more subtle look with a hint of gold, use gold eyeliner to bring out a rich and elegant look. Asian eyes can also benefit from the application of gold eye liner. 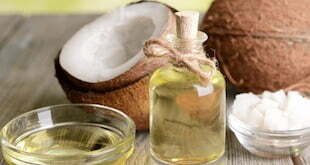 The outer edge of the lid and an extension from the corner of the eye, makes the eye appear larger and more prominent. Asians can also appreciate how the gold color brightens dark brown eyes. This is a rather subtle look that is very suitable to wear everyday with casual dresses. You have to be tricky while wearing gold as a highlight in your eye makeup. 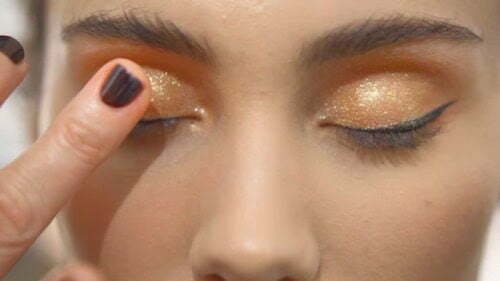 Apply gold to the area that is more prominent in your eyes like if you have almond shaped eyes, your eyelids are the most flattering part of your eyes so give them a lift of gold shimmer. For those having close set hooded eyes like the ones shown in the picture, gold highlighter should be applied to the brow bone and inner corners of your eyes to make them look wider and opened. 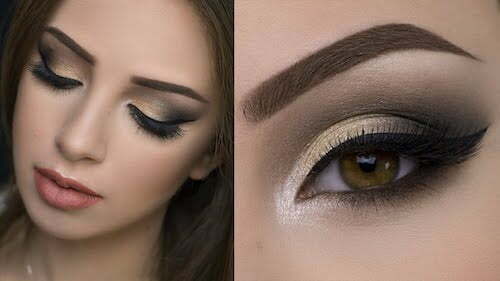 This fun gold Smokey eyes look is perfect for an evening out or for your first date. It makes your eyes so lustrous that anyone will fall for you. On naked eye, apply some primer first. Then apply winged eyeliner in black and give it an outline with gold starting from the middle to the full length and extend a bit from black as you see in the picture. 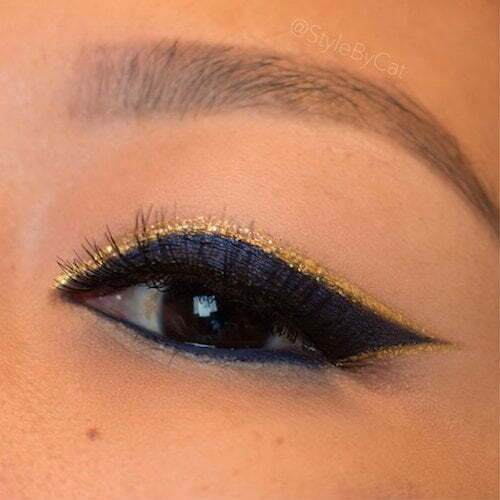 Apply the same gold liner on the inner corner of the eyes to add shine and freshness. Now apply skin gold to your brow bone and a sharper gold eye shadow to the entire lid and finish it with applying a bronze color to the outer corner and the crease. Now you can finish with mascara, liner, and fake lashes. 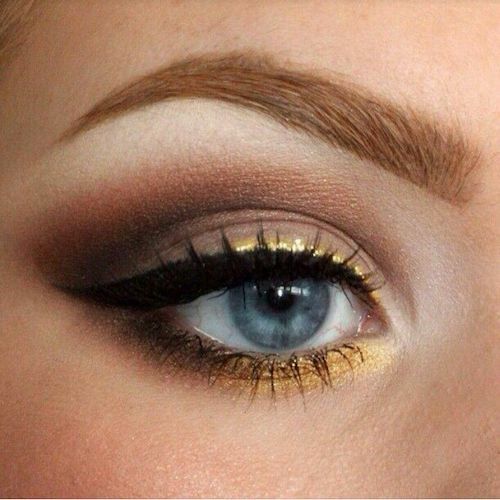 Here are some golden eye makeup tutorials to help get your very own gold accented eyes. As the above video shows, all that glitters can be gold with Glitter Injections Treasure glitter. Gold makeup can bring a rich and exciting look to your face. When working with golden makeup, you can try a lot of looks but the key is to create balance and highlighting only part of your eyes with the gold. 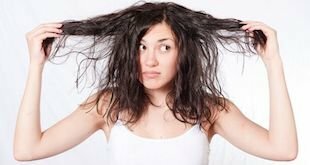 Don’t go crazy and overdo it.